In case of equality – by the highest place in another stage, etc. 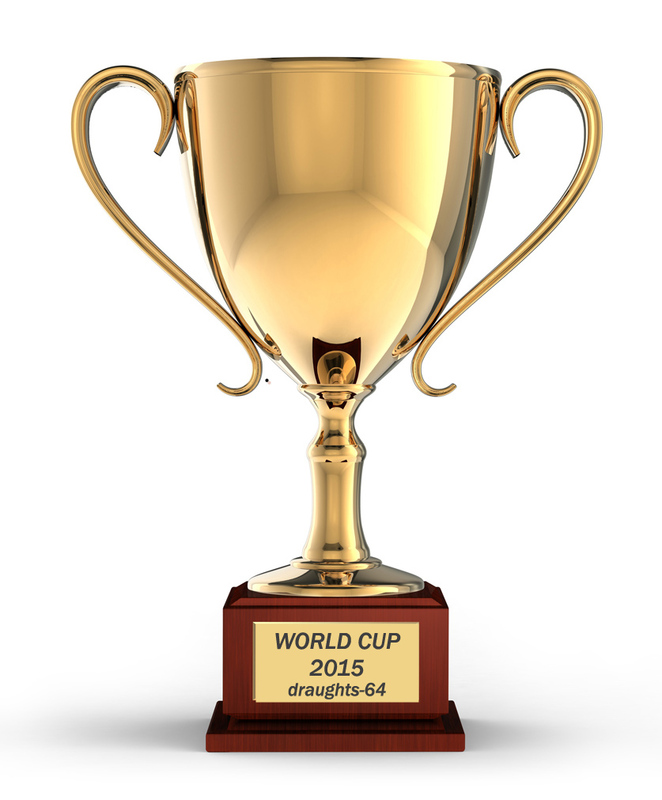 World Cup winner is awarded the title of “Winner of the World Cup 2015 in draughts-64”. The winner in the World Cup among women is awarded the title of “Winner of the World Cup 2015 in draughts-64 among women.” She is awarded the trophy and diploma. Participants, who took second and third place among women, are awarded with diplomas. The winner in the World Cup among juniors 1996 and younger is awarded the title of “Winner of the World Cup 2015 in draughts-64 among juniors 1996 and younger.” He is awarded the trophy and diploma. Participants, who took second and third place among juniors 1996 and younger, are awarded with diplomas. – The costs of the awards in the Overall World Cup (Cup, medals, diplomas, prize money) – at the expenses of International Draughts Federation.